The global methoxybenzene market has witnessed a steady expansion owing to the rising demand for pharmaceuticals and cosmetics, along with the application of the substance in the food producing segment. With derivatives of methoxybenzene as depigmenting agents and antioxidants as well as chemical intermediates in manufacturing bulk pharmaceuticals, the growing pharmaceutical drug market has been proven to be quite lucrative for the methoxybenzene industry. Upsurge in disposable income and the swelling consumer spending on body and personal care products has also positively affected the methoxybenzene market, with artificial fragrances made from the substance and its other properties suited for making products like lipsticks, shaving foams, perfumes and also make-up products. The personal care and cosmetics segment has in turn seen immense proliferation from the growth of organized retail and ecommerce, particularly in the Asia-Pacific (APAC) region. A seamless combination of marketing strategies, changing consumer trends and diverse demographics has altered shopping behavior across the world, influencing the sales of cosmetics, which a key target segment for the methoxybenzene market. A leading cosmetic brand has issued a report according to which the cosmetics market worldwide was valued at more than USD 232 billion in 2017, where APAC accounted for nearly 37% of the market share. The region has gone through tremendous development in economic structures and countries like China, India, Philippines and Malaysia have presented incredible opportunities for cosmetic companies. Organized retail has gained notable support from governments, encouraging the adoption of assertive legislations that allow investments into growing the retail sector, simultaneously profiting businesses associated with the cosmetics segment, including the methoxybenzene industry. Organized retail in India, for instance, is estimated to grow at a rate of 10% by 2020, augmented by a recent government announcement which said that up to 100 percent foreign capital will be allowed for single-brand retail. The emergence of the mall culture has further created an easier access for companies to reach consumers, raising the demand for cosmetics and consequently benefiting the methoxybenzene market in the region. The New South China Mall in Dongguan, China is one of the biggest shopping infrastructures in Asia and has about 2,350 stores, with several cosmetic brands undoubtedly capturing premium retail space. Similarly, large shopping centers like Central World in Bangkok, SM Megamall in Philippines, as well as mid-sized malls numbering in thousands throughout the region have poured in revenues for the cosmetic and personal care businesses. Givaudan, a Swiss manufacturer of flavors, fragrances, and active cosmetic ingredients, had informed in 2017 that India, Singapore, Thailand and Philippines had given double-digit growth in sales revenue where China market showing improved performance in the later half. This demonstrates existing prospects for the methoxybenzene industry in APAC for complementing the enhanced fragrance and cosmetic market. L’Oréal, the worlds biggest cosmetics brand, had indicated that in 2017, the key factors driving the cosmetics segment were the demand for better and premium products, the reach of social media and the continuous increase in sale of beauty products online. Experts confirm that the APAC regions is the largest generator of ecommerce sales of beauty and personal care products, exhibiting a 25% CAGR from 2010 to 2015. As such, the consistent rise in online availability of products will deliver higher consumption rates for cosmetics, while significantly reinforcing the methoxybenzene market. Extremely successful seasonal market strategies have characterized the APAC cosmetics industry, as they bring a reason for consumers to spend additionally on premium products. Statistics affirm that regions like Southeast Asia experienced the highest percentage of ecommerce sales, about 40%, in the months of October, November and December. 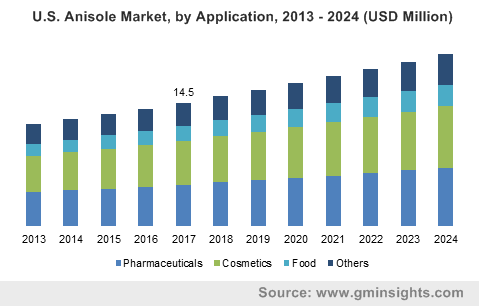 The figure represents the overall potential for the sale of cosmetic and other beauty products, along with a promising environment for the methoxybenzene market in APAC. The influx of foreign capital in economies such as China and India is expected to drive the growth of retail and ecommerce in APAC and strengthen the purchasing power of APAC citizens, gradually increasing the penchant for premium or luxury cosmetics. APAC accounts for around 30% of the overall industry share. All in all, an upward shift in the consumption of premium, imported personal care products and augment consumer expenditure predicted for the imminent future will propel the overall methoxybenzene market share in the ensuing years. Companies like Merck, Westman Chemicals, Solvay SA and Huaian Depon Chemical Co. are some prominent names comprising the competitive hierarchy of the methoxybenzene industry.